1. Dual interface (Bluetooth + GPS-mouse by USB cable). 2. Compatible with Bluetooth Serial Port Profile (SPP) completely. 3. Powered by one AA battery. 4. LCD display (32mm L x 8.9mm W) to show position information, speed, capable logging memory size, date & time. 5. Capable memory size to record up to 130,000 positions, including longitude, latitude, time, and altitude. 6. Personal settings to select the logging mode by distance or time, unit by Kilometer or mile, and 3 languages (English, Traditional Chinese, and Simplified Chinese) support. 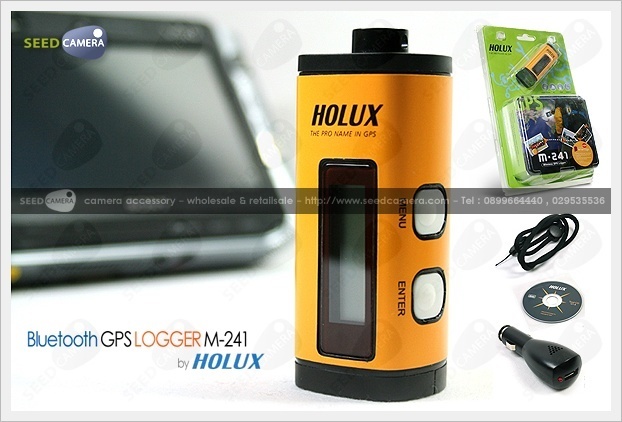 - Built-in MTK Low power consumption GPS chipset. - 32 parallel satellite-searching channels for fast acquisition and reacquisition. - Superior sensitivity, up to -159 dBm. - Built-in WAAS/EGNOS/MSAS Demodulator without any additional hardware. - Completely compatible with Bluetooth Serial Port Profile (SPP). - Low power consumption. Use AA alkaline batteries (or rechargeable batteries) for up to 12 hours of operation. - Provide expanded terminal contact to other systems without the Bluetooth device. - Compact and lightweight design for ease of use. - LCD display (32mm x 8.9mm /128 x 32 pixels) to show position information, speed, capable logging memory size, date & time. - Capable memory size to record up to 130,000 position data, including longitude, latitude, time, and altitude. - Personal setting to choose the logging mode by distance or time, unit by Kilometer or mile, and 3 languages (English, Traditional Chinese, Simplify Chinese) support. - Update frequency: 1 Hz. - Weight (excluding battery): < 39g. - Velocity: 0.1M / sec. - Standard: GPGGA (1 time per second), GPGSA (1 time per second), GPGSV (1 time per second), GPRMC (1 time per second), GPVTG (1 time per second). - Vibration: 20 M/ second3, Max.